The largest cost increases came from retirement benefits (which increased from $309 million in fiscal 1999 to $772 million in fiscal 2008) and health insurance (which increased from $273 million in fiscal 1999 to $554 million in fiscal 2008). 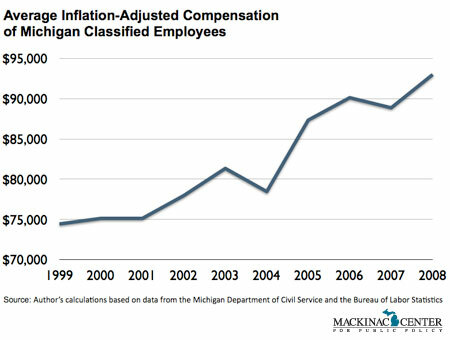 The wages and benefits of Michigan's over 50,000 state employees cost taxpayers $4.7 billion in fiscal 2008. This is up from $3.2 billion in fiscal 1999, despite the state now employing 15 percent fewer workers.